A car bomb in a crowded market in the southern Iraqi town of Hilla killed at least 12 persons and wounded 47 today, police and health officials said, a day after three car bombs killed 95 persons in the north of Baghdad. A destroyed vehicle sits near a market after a car bomb exploded in the southern Iraqi town of Hilla, 100 km south of Baghdad, on Friday. Pakistan has expressed readiness to sign an agreement with India on withdrawal of troops from Siachen glacier according to the understanding reached between the two countries in 1989. Instability in Pakistan will worsen and sectarian conflict could spin out of control unless President Pervez Musharraf cedes "real power" to civilians and removes curbs on moderate political parties, a think tank has warned. multi-party democracy in the Himalayan Kingdom, according to the visiting Indian political leaders. All the political parties represented in the visiting Indian delegation were of the view that arms supply to Nepal should not continue, CPM Politburo member Sitaram Yechuri said at a press conference here today. After being locked up in jail for nearly three months, New York Times reporter Judith Miller was released after agreeing to testify before a grand jury investigating who in the Bush Administration leaked a covert CIA operative’s name. Israeli forces killed three Palestinian gunmen in West Bank today, pressing ahead with raids against militants despite a halt to cross-border rocket attacks from the Gaza Strip. The death toll from yesterday’s attacks in Balad increased overnight from around 60, hospital Director Kassim Aboud said, as violence surged ahead of a referendum on October 15 on a new Constitution for Iraq. Insurgents are waging a campaign of suicide bombings, shootings and assassinations to try to topple Iraq’s US-backed government. The Constitution vote has raised sectarian tension between Iraq’s Shia majority and the Sunni Arab minority. Five American soldiers were also killed on Thursday in one of the deadliest bombings on the US military in weeks, near Ramadi, a bastion of Sunni Arab insurgency, west of Baghdad. In Hilla, police sealed off the area of the explosion at a vegetable market as ambulances ferried the wounded to three hospitals. 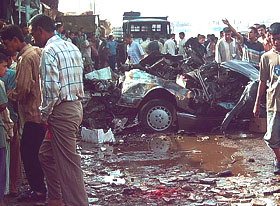 “A car bomb exploded at 9.15 this morning, which killed 12 Iraqi civilians and wounded 47,” a police source said. The US-backed government, dominated by Shia and Kurds, has faced intensified attacks by the Sunni-led insurgency since elections in January. “Pakistan was ready to sign the understanding reached between the two governments in 1989 without any delay, provided the Indian side was ready to do so,” the official Associated Press of Pakistan quoted a Foreign Office spokesman as saying today. Referring to a statement by Indian Defence Minister Pranab Mukherjee in which he reportedly said there was an agreement between the two countries on withdrawal of troops from Siachen, the spokesman said the Indian Minister might have been referring to the 1989 agreement on Siachen, in which the two countries came close to signing an accord, but they did not. He, however, pointed that there were some major differences on the modalities of withdrawal, which the two sides are trying to address. He said the two countries were engaged in intense negotiations to reach an early agreement on withdrawal of troops from Siachen, where their armies have been facing each other since 1984. The two countries have held several rounds of talks on withdrawal of troops from the worlds highest battlefield. Indian Defence Minister on Wednesday in an interview had said that the two sides had agreed on the need to withdraw troops from Siachen glacier but are stuck on verifying each other’s positions before they pullout. After the summit meeting between Prime Minister Manmohan Singh and Pakistan President Pervez Musharraf on the sidelines of the United Nations General Assembly in New York this month, General Musharraf had said the two sides had made considerable progress on Siachen. Foreign Ministers of the two countries are due to hold talks next week as External Affairs Minister K. Natwar Singh is going to Islamabad on a three-day bilateral visit. The two leaders will review the ongoing composite dialogue process and hold discussions on the third round of talks to be started from January next year. The International Crisis Group, in its new report "Authoritarianism and Political Party Reform in Pakistan," says General Musharraf's marginalisation of moderate political voices has allowed religious parties to fill a political vacuum and their increasing strength, if left unchecked, could erode regional stability. The report says mainstream political parties must become serious about internal reform if they are to steer Pakistan towards democracy and political stability. It recommends international help to strengthen Pakistan's moderate political parties and transform them into viable political players. "The Pakistan People's Party (PPP) and Pakistan Muslim League (PML-N, Nawaz) have regained some of the credibility they lost when they led governments during the flawed democratic transition of the 1990s. But their continuous subjugation to state coercion, coupled with their own internal weaknesses, leaves in question whether they can counter an interventionist military," the report says. Samina Ahmed, Crisis Group's South Asia project Director, says these parties "are the most effective safeguard against the religious lobby's anti-western agenda and still present the most credible alternatives to authoritarian rule." But, Ms Ahmed says, "the parties themselves must step up and make changes to ensure their own survival." "Since his October 1999 coup, General Musharraf, like his military predecessors, has sought domestic and international legitimacy through a civilian façade," the Washington Post noted in a recent report. "He has created his own party, the Pakistan Muslim League (Quaid-i-Azam, PML-Q) and brought it to power through rigged elections, the think tank notes. The PML-Q now heads the government at the Centre and in three of Pakistan's four provinces. Yet, its reliance on the military undermines its credibility as a representative and independent party." Political activists and rights groups complain General Musharraf has not been adequately pressured by foreign governments to return Pakistan to a fully democratic form of government. In an interview to the Washington Post earlier this month General Musharraf said President George W. Bush had not pressed him on giving up the presidency and "never talks about when are you taking your uniform off." The International Crisis Group report notes although the dangers are evident, the international community continues to support General Musharraf because of "his perceived cooperation in the war on terror, ignoring unconstitutional constraints on the civilian opposition." It said countries like the USA, which have tolerated authoritarian behaviour because they seek short-term security cooperation, should press the Musharraf government to hold free and fair elections, insist that it stop unlawful arrests and detention of opposition leaders, and be prepared to cut aid if it does not. 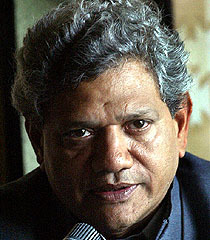 Robert Templer, Director of Crisis Group's Asia Programme, said, "The international community should make clear that its support - which has bolstered General Musharraf's claim to legitimacy will quickly evaporate unless he shows he is serious about taking steps towards democratic reforms." India should continue the arms embargo on Nepal in order to pressurise King Gyanendra to restore multi-party democracy in the Himalayan Kingdom, according to the visiting Indian political leaders. All the political parties represented in the visiting Indian delegation were of the view that arms supply to Nepal should not continue, CPM Politburo member Sitaram Yechuri said at a press conference here today. He also denied allegations by the Nepalese authorities that they were interfering in the internal affairs of the Kingdom. "We are not here to interfere in the internal affairs of Nepal, but to extend solidarity and moral support to the Nepalese people's movement for the restoration of democracy." If extending moral support to democracy is interference in internal affairs, then why VHP and Shiva Sena chiefs' remarks supporting the February Royal takeover were not an interference?, he asked. Yechuri said the Indian Government had recognised multiparty democracy and constitutional monarchy as the two pillars of Nepal's democracy and any deviation from that would not be in the interest of Nepal. It is upto the political parties here how they will talk to the Maoists and the King, he said. CPI's D Raja also said, "It is up to the Nepalese people to decide what type of democratic system they prefer, what type of constitution they want to draft, but our concern is only to extend solidarity and support. We have come here at the invitation of the seven-party alliance, we met several leaders and human right activists and we are confident that Nepal will succeed in restoring democracy very soon." Congress MP Chandrasekhar Sahu said, "We are here as a fact-finding mission and we came to understand what actually is going on in Nepal. I will apprise President Sonia Gandhi of the situation on returning home." Ever since the late Prime Minister Jawaharlal Nehru's time, the Congress has always been for democracy in Nepal, he said. "Our visit is not only informative but also educative as we have learnt many things during our interaction with various political parties," Sahu said. Miller agreed to appear today before the grand jury, which has been investigating who leaked CIA operative Valerie Plame’s identity and whether any laws were violated. Miller met with Libby on July 8, 2003, the newspaper said, and talked with him by the telephone later that week. She was released from the Alexandria Detention Centre just outside Washington after she and her lawyers met at the jail with Patrick Fitzgerald, the prosecutor in the case, to discuss her testimony. Legal sources said Miller’s testimony appeared to clear the way for Fitzgerald to wrap up his case, which could shake up an administration already reeling from criticism over its response to Hurricane Katrina and Wednesday’s indictment of House Republican leader Tom DeLay. The leak investigation has ensnarled President George W. Bush’s top political adviser, Karl Rove, as well as Libby.